Jose M. Lorenzo has years of experience in dealing with guardianship, probate, and personal injury issues across the state of Florida. Located in the Miami region, Mr.Lorenzo is not only trusted by clients, but respected by peers across the legal community. He has been well-versed in these areas since law school. where he performed in trial competitions. Additionally, Mr. Lorenzo clerked for the Honorable Judge Maria M. Korvick in the Probate Division of the Eleventh Judicial Circuit Court of Miami, following almost a decade serving as a paralegal in two leading Miami Law Firms. 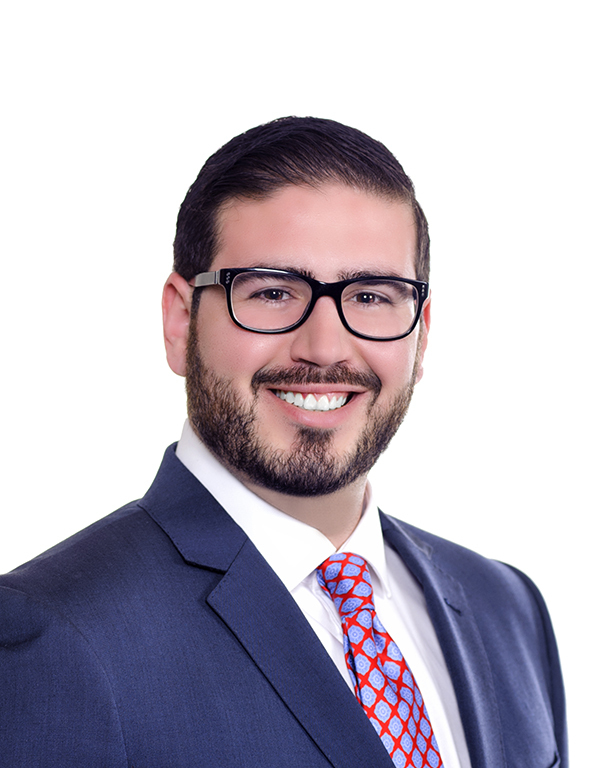 Mr. Lorenzo earned his bachelors degree in accounting and finance from Florida International University College of Business in 2009, and achieved his Juris Doctorate (J.D.) in law from FIU’s College of Law in 2013. He has skills in a broad range of areas from public speaking to civil litigation, and aggressively defers the interests of his clients. It is true that most personal injury cases are settled out of court — and so are a good many probate cases. Many lawyers have mastered the art of out-of-court negotiation, but not nearly as many have mastered the art of winning at trial. Jose Lorenzo, however, has been confirmed as a National Academy of Trial Lawyers “Top 40 Under 40” trial lawyer, an award bestowed upon only 40 lawyers in each state. And that matters very much, even if your case is settled out of court. Defendants laugh at lawyers who talk a good game but cannot back up their demands by winning in court. Even if your case never makes it to trial, your only real bargaining leverage is the defendant’s knowledge if the case does go to trial, he will likely lose. Insurance companies in particular do their homework, and they know which lawyers win at trial and which ones don’t. Retaining a good trial lawyer is one of the best ways of ensuring that the defendant experiences an “attitude adjustment” that will lead to a reasonable settlement offer. In probate court, settlement might not even be an option — which is all the more reason why you will need a good trial lawyer to protect your rights. He can calculate the true value of your claim: You cannot negotiate effectively unless you know how much your claim is worth — and it might be worth more than you think. He can identify the right defendant: Suppose you are injured by someone with insufficient insurance to cover your claim. Depending on the circumstances, Jose Lorenzo can help you identify other possible defendants — the perpetrator’s employer, for example, or the manufacturer of a defective auto part. He can help you avoid common mistakes that could harm your claim, such as posting on social media while your claim is pending. He can collect admissible evidence: Evidence is useless unless it can be presented in court, and the rules of evidence can be very counterintuitive. Mr. Lorenzo can help you effectively navigate the complex rules of evidence. Negotiate on your behalf. Any settlement, of course, will require your prior approval. File a formal complaint with a court of law. Help you navigate the complex rules of Florida civil procedure. Advocate on your behalf at trial. Draft a settlement agreement that contains no loopholes for the opposing party to exploit. If you are involved in a personal injury or a probate dispute, or if you anticipate such a dispute, contact Lorenzo Law immediately by calling us at (305) 999-5411, completing our online intake form, emailing us at jml@joselorenzolaw.com or visiting one of our offices in Coral Gables or Ft. Lauderdale.The sooner you act, the better your chances will be. Mr. Lorenzo has litigated or guided clients through a number of successful cases in a wide range of unusual circumstances. These include helping a surviving husband seeking property rights regarding a waiver of elective share rights and Homestead Rights. With Mr. Lorenzo’s help, he was able to preserve his rights and keep his family allowance. Another successful case arose when Mr. Lorenzo helped to protect the rights of a grandson seeking to serve as a legal guardian of his grandmother, who had become incapacitated and had issues with Joint Tenancy with her deceased husband, to whom (through paperwork mishaps) she had never been legally married. In this case, the assets were held as husband and wife but issues arose when it was determined that they were never legally married. Mr. Lorenzo was able to establish that the incapacitated Ward and her deceased husband were in common law marriage. Therefore, he incapacitated Ward was able to obtain the assets through joint ownership.